The Damn Yankee crossed into North Carolina as Jim and I lunched on tuna salad sandwiches that we washed down with a celebratory Heineken for Jim and Corona for me. The alarm shrilled through the cabin. I rolled onto my stomach and burrowed my head beneath the pillow in protest. It couldn't be morning already, could it? "Time to get moving, Gwen." Jim added emphasis with a light tap on my rump. "I'll start the coffee then I'll be disconnecting the power." "Whoa…" I mumbled. Jim was way ahead of me here. I managed to raise one eyelid to total darkness. I was right. It was night. I knew Jim was anxious to head into the ditch today but this was pushing the envelope. Bleary-eyed, I peered into the saloon where Jim moved purposely in and out of threads of light from the Waterside complex that filtered through the cabin ports. NOOA weather's wake up call filled the cabin. I dropped my head onto my pillow and listened to something about light winds at five to ten and a temperature approaching seventy, not too bad for our first day in the ICW. I was feeling more awake by the minute. "Come on." Jim calls from the galley. "We've got to be ready to head out at first light." Jolting upright, I indulge in a lingering glance at the tangle of warm blanket before pushing the covers aside. "And first light is, when?" I tease joining Jim in the saloon. "Too soon." He mumbles yanking open the nearest drawer. "Where's the chamois? I need to wipe the down the isinglass." I pull open the opposite drawer and hand Jim the chamois before switching on a lamp. "It's cold." I comment to no one as Jim has gone topside. But the coffee is ready and its rich "good morning" smell distracts me from my shivering. I pour two cups. One good gulp and the rush of caffeine propel me forward to make up the V-berth and get myself dressed. I snug into a pair of sweats and grab a pair of Jim's argyle socks. After all, we were on the cusp of November. I buttoned a long sleeved shirt while pulling a sweatshirt over my head. I was still cold so next came a heavy, lined hooded sweatshirt that a lumberjack might covet. Not quite satisfied, I rummaged in the hanging locker for my Gill jacket, shrugged it over my shoulders and headed toward the companionway to join Jim. Except the cabin's doorway had shrunk. I was also moving decidedly slower. And I'd forgotten to brush my teeth. Finally daybreak lightened the cockpit and I could make out my own hand in front of me. 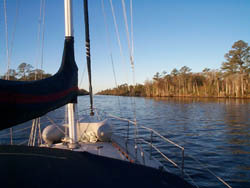 Jim finished wiping down the isinglass; all the better to see down the Intracoastal I thought. Beyond the shadowed bow of the American Rover the sky began to brighten on the horizon to a pearly luster that rose from the water. Clear and sunny was the weather prediction. Today would be another good day. I just knew it. Lights glowed now from our neighbors' portlights. I glanced about filing the memory of the morning we entered the ICW. Sail, trawler or power, morning preparations remained the same. From our cockpit I watched the woman next door through her side windows, aboard a forty-five foot Hunter, stow and straighten. I look away quickly not wanting her to catch me staring. Glad that I had agreed to Jim's suggestion last night to take the time to stow the television, the decanter, glass bowls and family pictures, I could spend a few minutes now observing the activity around me. Nonetheless, I stooped to scan below for something I'd missed. Only the lamps were left. When Jim disconnected the power I'd stow them away. "Can you take this below?" Jim asked carefully handing me the fifty feet of power cord. "Sure." I said hoisting the long coils over my shoulder and heading below. "I could use another coffee when you get a chance." "Be right there." I called dropping the power cord in a heap in the back cabin and reaching for the lamps. "Oh, and bring up the Intracoastal books and a pencil. I need to check the mileage on the first bridges." "I could use the binoculars too. Gwen, where did I leave my glasses…?" The lamps could wait. I like a man who knows what he wants even if he doesn't always know where it is. Smiling, I refilled his coffee and brought it topside. Below, I grabbed the books and the binoculars. And the pencil, I almost forgot the pencil. I'd refill my cup later. "I'll need my glasses," Jim declared. "Can you…?" I swallowed my snappy retort. Absorbed in, The Intracoastal Handbook, he flipped through the pages and never looked up. I headed below to search for Jim's glasses. "You may as well bring up my sunglasses too." "Will do." I answer rummaging for both on the shelf above the navigation table. "Are we set now?" I ask grabbing a quick gulp of my now cold coffee before Jim answers. "Yeah. You can go forward and untie the bow lines and pull up the bumpers." "Aye, aye, Captain; Bligh," I mutter heading forward. Minutes later we were gliding past the waterfront with the Waterside behind and the naval repair facilities on the left. The engine hummed and vibrated beneath our feet. I was finally sipping my second cup of coffee. "Just look at this, Gwen." Jim motioned me to the helm. "This is unbelievable." He remarked pointing out the detailed accuracy of the C-maps for the Intracoastal we'd purchased. Even to me, the route was laid out in colored precision. Every twist and turn, each marker and bridge is plotted for the helmsmen. "They're look like arcade games where you have to stay within the lines." I commented. But, I remained skeptical. I was never any good at those games. I'd either crash within seconds or wind up speeding in the wrong direction. "You could say that," Jim agreed. "But we'll still need to verify using the chart books. That'll be your job. Just follow along. Give me a heads up if there's something I need to know." Feeling absolutely affirmative today, I nod emphatically wondering what information would constitute a heads up when the C-maps appear to have covered everything. Picking up The Intracoastal Waterway Chartbook, Second Edition by John and Leslie Kettlewell, I turn to the preface determined to find out. "We're going to follow behind those two boats." I glance up from my books to see a white-hulled Caliber with a navy dodger and the familiar beige of an Island Packet whose cockpit is fully enclosed in light burgundy just off our port bow. "You'll meet them tonight. Ray's done the trip half a dozen times." As if on cue the man aboard the Caliber waves. I assume that's Ray and wave back. Underway, we three boats slide forward. If not quite at first light, it's early enough for me at seven thirty. There is a chill and condensation films the deck. But the anticipation of this new experience warms pulling us ahead. The Damn Yankee falls in behind the vessels, Casa Blanca and Cut'em to approach the first bridge. The bridges offer the first challenges. Heart in throats, we follow the two boats ahead motoring from lift bridges to bascule bridges both single and double, on to swing bridges and pontoons. We passed underneath eight bridges and were dropped into non-tidal waters at the Great Bridge Lock, all within the first twelve miles. "Where is the sign for mileage marker one?" I ask craning my neck for the signpost I'd always imagined. "You missed it. It was back at buoy thirty-six. You were checking the books." "Gwen, there is no sign. I missed it too." Jim said with a shrug. "But we planned to take a picture…"
I nodded and went back to my books vaguely disappointed. But not for long, my attention was caught by the urban sprawl of concrete buildings and steel cranes that punctuated the landscape here. The acute angles and sharp projections colored in drab industrial shades of gray and brown stood conspicuous like ragged notches against the sky. There was a futile feel to the scene. We swept underneath the sixty-five foot clearance of the Interstate Route 64 Highway Bridge without slowing and passed the Dismal Swamp Canal for the Virginia Cut route. "It says here if you use the Dismal Swamp route you need to verify it's open with the Corps of Engineers' office. There's supposed to be a closed sign." I'm not sure if my declaration falls under a "heads up" but Jim would know I'm taking my job seriously. "I never planned to take the Dismal Swamp first time out." "Good. It says the controlling depth is six feet for seventy-five miles. And the name, Dismal Swamp doesn't sound too reassuring either. Why are we stopping?" Sure enough, a barge is backing into the canal from its berth. It appears to extend the full width of the waterway. "We've lost Casa Blanca and Cut'em. They were far enough ahead to miss the barge. Damn it." "It's okay." I venture. "We can catch up, can't we?" "I don't know. We'll just have to wait." Jim says as he turns the wheel into the current. Another few minutes and we were on our way. "I'm going to let the boats behind us lead the way." No one moves forward. Jim calls over the hand held. "Go ahead, Damn Yankee. We'll follow you," comes out loud and clear. "Roger that." Jim answers without enthusiasm. Seconds later, undaunted, he tries again. Tomlin Two or Kachina, you've probably got more power. Come on ahead, the Damn Yankee will slow and tuck in behind." "Negative, Damn Yankee. Tomlin Two is new at this. This is our first trip. You're doing fine." "The Kachina is happy to follow too, Damn Yankee." I almost laugh out loud at Jim's expression. I have to look away. Resigned frustration etched in disbelief, he throttles forward. We pick up speed. I can't resist. "Some things never change, huh? Art and Lou would never believe this." I shoot him a grin and continue. "It's the way you handle the boat, honey." I take his grunt as agreement and decide to quit while I'm ahead ostensibly turning my attention back to my books but I'm remembering the "Damn Yankee" leading the way because we had a year or two more on the bay. We'd head into the harbors at Annapolis and St. Michaels. We'd glide through Kent and Knapps Narrows or up the wide Patapsco River to Baltimore and into the narrow channel to Herrington Harbor to offer the experience with diminished stress. Being on the receiving end of "Casa Blanca's"
experience was Jim's plan, a way to let him concentrate on the feel of the current against the "Damn Yankee's" hull, familiarizing himself with waterway depth and navigational aids. "There's another bridge ahead," I comment realizing I wasn't paying proper attention. Jim was already speaking to the bridge tender at the Dominion Boulevard Bridge on the hand held. "Come on ahead, Captain. We'll give you an opening." Two minutes later and we swept between the footers. "Thanks for the bridge opening Dominion Boulevard." "Anytime, Damn Yankee. You have a good day there, hear." Bridge protocol, I thought waving away at the bridge tender. "What does it say about the locks?" "Locks." I stood up to scan ahead. I could see nothing but a twisting ribbon of water whose banks were tree choked with overhanging branches. There was not a lock in sight. "You did say locks, like in Panama Canal locks?" "That's right. They're at the land-cut as we enter the Albermarle and Chesapeake Canal." Just when I was beginning to enjoy myself. The acrid industrial smell had subsided earlier. I was appreciating the fresh smell of soil and water. "Read me the lock instructions now, before we get there." I was speed-reading down the page while my stomach knotted. Words like locktender, horn, gates, red, green, signal, docklines, lockwall, surge and turbulence leapt from the page while I tried to make sense of the instructions. My stomach knotted tighter as I read the two long paragraphs out loud. "Okay. Get your fenders and uncoil two lines," Jim instructed. "Where are you going?" "We need the boat's documentation number. They might ask for it." I worried for nothing. Standing on the bow as the Damn Yankee approached the dock with a length of spring line in hand ready to toss, I had only to listen and follow the locktender's directions. He spoke in an easy drawl instilling confidence. With no hitch in my toss the locktender looped our line around the ballard before heading to the stern to do the same. I held my post as we slowly dropped the two and a half feet while I slowly let out more line to keep the boat parallel and close to the wall. When I dared to glance around at my surroundings, Cut 'em lay secure directly in front of us and her first mate sent me a wave and a smile. Quicker than I anticipated we were pulling away at slow speed to avoid pushing another boat into the wall. No stomach knots now, we'd managed the locks without incident. I felt proud and eager for our next challenge. Instead the next hours found us quietly absorbed in the rural countryside passing either side of us. Some well-spaced homes sat surrounded by towering oaks whose leaves splayed splashes of brilliant yellow. The leaves had begun to turn. I followed our progress on paper and within the element of water that stretched seemingly endless. By scanning ahead I began to recognize the ICW's square green markers as opposed to the red markers with each odd and even numbers. Heading south, regardless of shape and color any marker with a reflective yellow triangle should be left of starboard and any marker with a yellow square should remain to port. Marine logic, I concluded and struggled to clarify to myself. Taking pity, Jim explains the markers as "curbstones." He points out how lining up the markers allows a run down the middle regardless of the serpentine vagaries of the waterway. I wished I could just follow the wake of Casa Blanca and Cut'em but they were too far ahead. "We'll be fifty miles into the Intracoastal tonight, Gwen." "Wow!" Fifty miles into the ditch, I knew we'd have a good day. 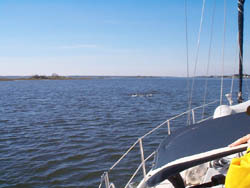 The North Landing River widens beyond Gibbs Point expanding to run the next eighteen miles. The Damn Yankee runs with it. We skirt Currituck Sound past mile marker forty. Its open expanse reminds me of the Chesapeake, night dark water and a distant shore. "See the next land-cut up ahead?" Jim gestures to a spot off the bow and I look beyond the next marker. "Good. I like being closed in within the waterway better. There's more to see." "That's the North Carolina Cut. A mile or so inside we'll be at Coinjock." "Really." I willed the engine to push the Damn Yankee a little faster. Coinjock, N.C. was, for me a physiological hurdle for no other reason that for ten years, Captain George Fletcher of the Reel Deal never uttered the name without a barking laugh and an expression of pure bliss on his face. over the hand held directing us to head into the small basin abutting the dock nearest the office. 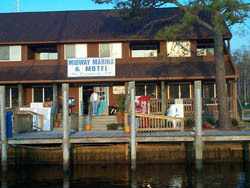 The sign read, Midway Marina, Coinjock, N.C. Four-thirty in the afternoon and we'd made a fifty-mile run. Jim turned the Damn Yankee slowly in the basin to ease her bow forward as we tucked in behind a large trawler. Before she nudged the dock I tossed a line to a smiling gentleman in shorts and a navy polar tech jacket. "I like a man who can handle his boat, Captain. Terry Miles here." He reached for Jim's spring line then took the stern line to hold us steady. "Thank You, Capt. I'm Jim and my wife, Gwen." "Welcome to Midway Marina. I hope you enjoy your stay." The two captains shook hands. I extended my own. Captain Terry took it with a mischievous grin. "The first time we shake hands. Next time you get a hug. You're family." That said he turned away down the dock. I took ten minutes or so to straighten up below while Jim retied lines and adjusted the bumpers. "I'm going to check in, Gwen," Jim calls from the dock. "Not without me, you're not." I launch myself into the cockpit and hit the dock running to catch up. "The man promised next time I get a hug!" In three long strides I was ahead of Jim and call over my shoulder. "And I want it now."